Although the English weather might not be telling us its summer, we are already in the season of summer that should promise to bring us bright hot and sunny days. For most owners of Mamod steam engines, this is the perfect time to steam up. It's Sunday afternoon, the day has slightly cooled from midday and your relaxing in the garden, steaming up your engine. For this reason, here are some essential tips to help get you and your engine ready for summer. I usually try to squeeze an extra solid fuel tablet onto the burner tray to give it a bit more oomph (as the water in the boiler can get much hotter). This increases performance. If I steam one engine up, I can't help but steam all my engines up and create a little funfair style steam up! You can usually steam up an engine twice on the same water. After two steam ups (gone through two lots of fuel), that's when you need to probably refill the boiler. A steam up for me consists of one fill up of water. Therefore, I usually steam each engine up twice. Therefore, by the end of a steam up for me, I have gone through usually a whole packet of tablets (around 20 tablets). What I found I should do was stock up on fuel for summer. You never know when you are going to steam your engine up so make sure you always have fuel to give yourself the opportunity to steam up whenever you want to. Steam up Endurance - This game is between two or more engines. You fill each engine with the same temperature water and place the same amount of fuel under their boilers. After that, you then move each flywheel so they start running at the same time. Which ever engine runs for the longest is the winner! After playing with a few of my friends and their engines, we started to get quite competitive and try to make our engines more efficient so they last long (such as super heating it with the SE1/2 range). Traction Sprint - Involving the traction range of Mamods, this game involves a straight race of around 10 metres. You start each engine at the start line and lock the steering so it goes in a straight line. Which ever engine first crosses the finish line is the winner! A few tips on this, steam rollers are the slowest and then traction engines. I found my steam wagon to be pretty fast without the roof on it. It is also advisable to put rubber tyres around the wheels as this will help the engine run better on lumpy surfaces. Tick over Specialist - For all types of Mamods, this game is a favourite of mine because I love the sound of engines when they are ticking over. You and your friend have to use the speed regulator on their engine to make the engine rotate around as slowly as possible (so it sounds like it is ticking over). This is quite difficult as you will find the engine will stop if you get too slow. These games are pretty fun even by yourself with a stopwatch! It makes steaming up an engine much more enjoyable...you don't have to just watch your engine go! If you really want to make things interesting, you could do bets between your friends so there is a stake running on each game! A bucket of water to quickly exterminate any uncontrollable fire. Gloves to protect your hands from the hot surface of the steam engine if you need to move it. Steaming up by yourself is fun and enjoyable to do. However, steaming up around others is always much more fun. The best way to do this is through barbecues and other social events. No matter how mature men are, they will always get enticed into playing with your engines because they are a thing from their childhoods. As well as this, children love it! Steam engines are a great item at social events. 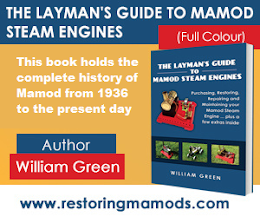 Summer is a great time for Mamod steam engines too - take advantage of the weather and get your engine out! Who doesn't love the smell of a Mamod running and the sound of a high pitch whistle?